I had a lot on my mind yesterday. I know this because I spent a fair amount of time masquerading as a sour-faced-sharp-tongued-take-no-sh!t-kinda-b!tch-mama. From the moment I woke up, I was down on life, down on my lot, down in the mouth for no reason, other than being bludgeoned by a drudge of thinking. Whilst the rest of the family sat down for the multifarious breakfast eggs cooked by my husband, I swept the floor, wiped the counters and (rather noisily) put the dishes away, crashing them into the cupboard. I spurned my hot-fresh-outta-the-pan cheese omelette in favour of a dish eaten cold. I was not good company. Feeling time pressed, as I did (we had an early morning hospital appointment and an early afternoon Shakespeare class at home to prep for) I snapped and issued orders to anyone who crossed my field of vision. It was only as I was punishing washing the plates that it occurred to me that I was living in the future. My train of thought had whisked me away to the middle of the afternoon. It was no wonder I was snappy; I wasn’t really here. Just then, the picture of a balloon came to mind. The other day, my husband filled a bunch of them with helium, and as they filled, they naturally wanted to float. 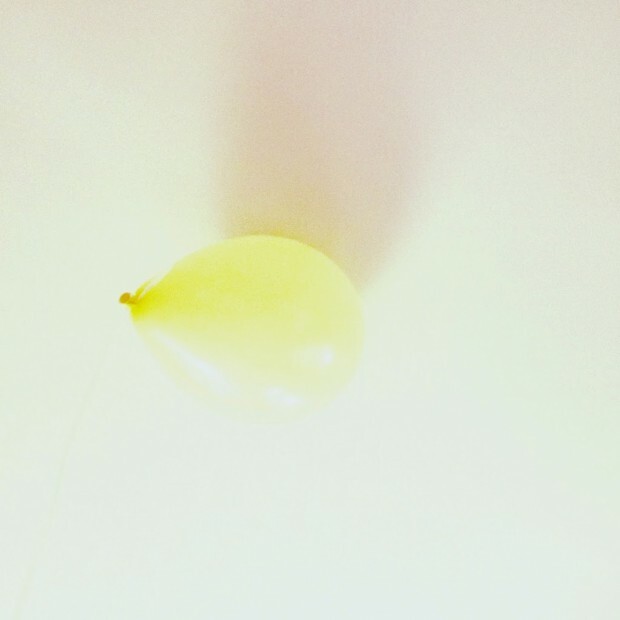 My young son had never seen this before and he took great delight in pulling the ribboned, yellow balloon towards him again and again, then letting it go, giggling as it freely and easily bobbed up to the ceiling. I was reminded of our natural buoyancy – a lightness of being that permeates the very marrow of us and nestles just beneath the surface of our heavy thinking. Our nature is just like that of the helium balloon. Our good feelings want to rise to the surface; that’s just the way we’re made. Though it seemed as if my dour mood was coming from my domesticity, the truth is that when I stopped to look, and began to doubt this reality, my good feelings popped back up as if they had never gone away. And honestly they hadn’t gone anywhere – I had. It takes great mental and physical effort to maintain this heaviness – to unwittingly take ourselves away from our in-built wellbeing. But this is all a part of the richness of the human experience. I am grateful that I have caught a glimpse of the invisible human operating system. For me, gaining an understanding of the nature of Thought and an awareness of the presence of Mind helps me to keep my bearings in this bumpy game of life. Our feelings are the barometer of the soul. They are the measure of our thinking. They let us know what mental weather we can expect. They let us know how we are faring in life.